By Leana Wen and Joshua Kosowsky. New York: Thomas Dunne Books, 2013. ISBN: 9780312594916. 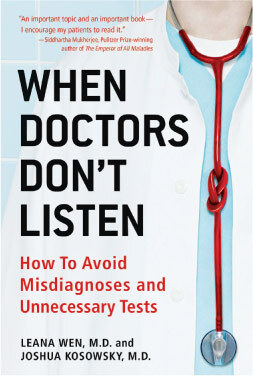 When Doctors Don't Listen is a recently published book written by two emergency medicine doctors from Harvard University, USA. Their objective: to improve emergency department diagnostic accuracy while minimising unnecessary (and expensive) testing. There is a surprising catch - the book is aimed primarily at the patient rather than the doctor. That said, clinicians will still find this a fascinating read. Every year, up to a third of the USA's $2.6 trillion annual healthcare cost is spent on unnecessary medical testing and hospitalisation. This, the authors argue, is fuelled by rampant patient consumerism for the latest medical technology coupled with the growing practice of 'cookbook medicine'. Cookbook medicine is the practice of approaching clinical problems using rigid, non-individualised 'diagnostic recipes' or 'pathways'. Hallmarks include the overdependence on technology (to 'rule-out' rather than 'rule-in' diagnoses), minimal critical thinking, and absent patient-centredness. This disassociates the diagnostic process from the individual's narrative, leading to patient dissatisfaction and increased litigation. To avoid falling victim to cookbook medicine, the authors propose a stepwise strategy for patients - 'the 8 pillars to better diagnosis'. This strategy advocates patients to become more involved in the management of their health, and when visiting doctors, in the making of their diagnoses. Although this idea may appear quite foreign and even consumerist, the advice given is genuinely useful. Advice includes how to best present one's complaints and medical history (e.g. preparing a summarised list of past conditions and treatments or keeping a symptom journal); to participate and aid the doctor during the physical examination; to ensure that the doctor formulates a thorough differential diagnosis; to partner with the doctor in the decision-making process regarding testing and treatment options; and to assert oneself in the doctor's thought process without being seen as a difficult patient. Included in the book are worksheets and exercises for use when preparing for a medical visit. One criticism of their suggestions is that they are not universally applicable, especially in parts of the world where the standard of education is poor or where health services are under-resourced. The book includes a section aimed at doctors, presenting advice on how to be more patient-centred and communicate better, among other things. Giving the patient more responsibility during decision-making is also presented as a possible buffer against litigation. The text is written as a conversation in the first person between the two authors and reads very well. Throughout the text the authors have successfully employed a mix of clinical vignettes and panel discussions with the individuals involved. This makes for a lively read. Ultimately, When Doctors Don't Listen advocates and demands further reforms in the delivery of patient-centred care from the modern doctor. Although this book is primarily written for the American patient, South African medical readers will nevertheless find it an interesting read. The book ends with a prescription for a more functional, leaner and lower-cost future American Health System: 'Cut the cookbook recipes, the "rule-out" and the "pathways" in favor of a thoughtful, common sense, and individualised approach to medicine.' This may just be the solution.